I'm Counting to 10: Hope and Humor for Frazzled Parents - Jahnna Beecham & Malcolm Hillgartner - All parents of young children have a secret, something they find amusing that other adults consider disgusting. Accidentally swallowing the cup of water your daughter used to brush her teeth, pointing out road kill to stop the kids from fighting in the car, letting the neighbor boy - who can¹t find a Kleenex - blow his nose on your skirt. Not for the faint of heart, or for those in pre-parent years (they may choose not to have children after reading this book). Parents in the trenches, however, driving minivans filled with Happy Meal containers, discarded clothing and melted crayons, will find inspiration and understanding in this book. Larry's Review: An "easy-read" book all parents can relate to. You'll enjoy this book! 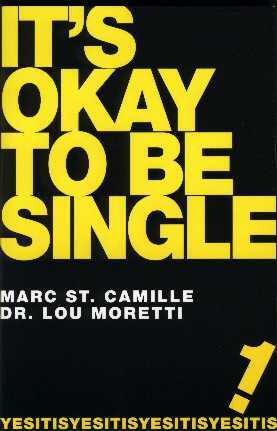 It's Okay to be Single - Marc St. Camille & Dr. Lou Moretti - This book's title is the much needed affirmation of life for the single person. The authors suggest you rejoice and celebrate should you find yourself single. That being single can be the best time of your life. Full of great experiences, self-discovery and happiness. The book breaks down why people feel compelled in the first place to be in a relationship and proceeds to suggest creative alternative ways of fulfilling many of the reasons people often use to settle with someone. At times serious and often humorous the book is written for anyone that might find themselves single. Larry's Review: There is no shame in being single. This book tells you why. Triumphs of the Heart: Miraculous True Stories of the Power of Love - Chris Benguhe - Triumphs of the Heart is a diverse collection of remarkable and inspirational true stories about people who have overcome great obstacles - with love as the catalyst for their heroic endeavors. Read amazing accounts of the real-life miracles that love makes possible - twenty-five tales of heroism and healing depicting the invisible but immensely powerful bonds of love that connect us all. Forward by President George W. Bush. Raising Humane Beings - Jane Fendelman, MC - This book delivers inspirational parenting information and solutions in a dynamic light-hearted way. Cure ADHD, Oppositional Defiant Disorder and other challenges without drugs. Ask for what you want without repeating, feel empowered and have more love and joy in all your relationships. Larry's Review: Chrismatic Jane loves children. She is a masters-level therapist whose private practice has helped hundreds of families raise better kids in a kind, loving and "humane" way. Highly recommended.